"The book not only gives a clear picture of the policy and strategic framework of PFI/PPP projects, the governance and knowledge management issues through different phases from planning, design development to operation and service delivery and the processes associated with each phase, but practical tools, methodologies and capabilities needed to deliver PFI/PPP projects in a range of sectors are also explained. It clearly demonstrates the key imperatives that are the hallmark of successful programmes and projects no matter what there method of funding or delivery. I have no doubt that, in undertaking the programmes and projects that I am responsible for delivering and in undertaking OGC Gateway Reviews, to support clients delivering their own programmes and projects, I will draw on the material contained in this book." There is a growing demand worldwide for transport, healthcare, education, energy and water infrastructure. However, government resources are often insufficient to meet the needs of new projects and to upgrade existing infrastructure. Private participation in public infrastructure is therefore increasing but the respective roles of the public and private sectors are the subject of intense debate. This has led to renewed interest in public-private partnerships in developed and developing countries. 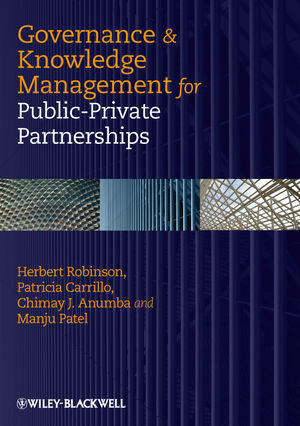 Governance and Knowledge Management for Public-Private Partnerships shows how effective governance and knowledge management can improve the performance of PFI/PPP projects. It provides an in-depth understanding of different dimensions of governance and how they affect project management structure, processes, and decision-making ability of actors and teams involved in PFI/PPP projects. The role of knowledge management strategy, the need for benchmarking knowledge management efforts, specific tools and methodologies for capturing, sharing and applying knowledge to accelerate learning and capacity building are also examined. The book is essential reading for all those involved in PFI/PPP projects, including policy makers, industry practitioners, academics and students. The practical tools for governance and knowledge management it offers make this book particularly useful for consultants, contractors and client organisations. Dr Herbert Robinson is Reader in Construction Economics and Project Management at London South Bank University, UK. Professor Patricia Carrillo holds a personal chair in Strategic Management in Construction, in the Department of Civil and Building Engineering at Loughborough University, UK. Professor Chimay J. Anumba is Head of the Department of Architectural Engineering at Penn State University, USA. Dr Manju Patel is Acute Sector Planning Lead at NHS Grampian in Scotland, UK and holds a council seat in the Institute of Health Engineering and Estates Management.